Don't sweat your shoulder turn in your backswing, just make sure to get your right hip pocket behind you as the clubhead reaches the top. Let's say you've studied your stats from last season, and accuracy off the tee is your Achilles' heel. Sure, bombing and gouging works for Bubba, but you know you'd score better if you could keep the ball in play more often. Here are three keys to help you split the tightest fairways. Let your arms, shoulders and hips work as a single unit to take the clubhead away from the ball. If your arms move independently of the other three parts, the path of the club will be overly steep. 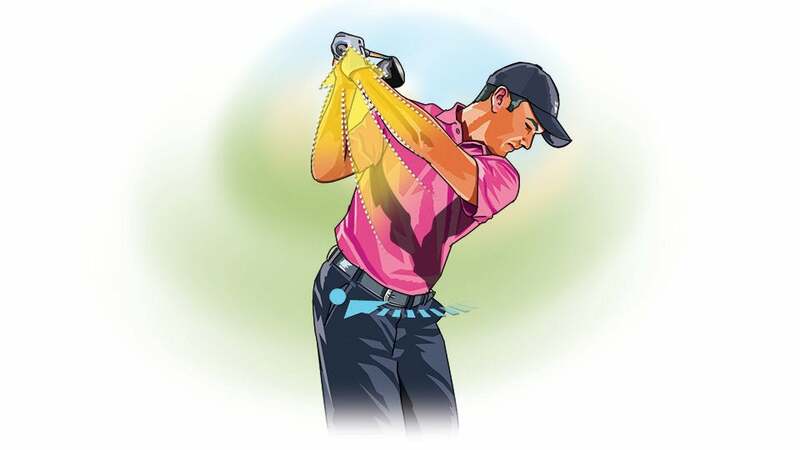 If your shoulders move prematurely, you risk pulling the clubhead too far to the inside. Syncing up all three pieces lets you start the club back on plane. Don't worry about turning your shoulders. Focus on rotating your right hip pocket behind you on the backswing. Do this and your arms and torso will reach the top together, not independently, a swing fault that can disrupt your timing. You'll also make a deeper turn, which promotes an inside-out path and a full, powerful release. As you swing down to the ball, let the clubhead go—you should feel as though it's passing your hands through impact. This will help you square up the clubface and deliver more speed to the ball. A lot of golfers try to steer the club or hold the face square, but this drains power and leads to a pushes and slices.